Love a book so much you want the world to read it? World Book Night needs book-loving volunteers to fan out across America on April 23, 2012, to help share their passion for reading. Sign up here to join the movement by Feb. 1. So what happens on World Book Night? Volunteers simply take 20 copies of a book to a location in their community and give them to the people they see there. For free. The goal is to give books to new readers, to encourage reading, to share the passion for a great book. Full details can be found here. Reading changes lives and at the heart of World Book Night lies the simplest of ideas and acts — that of putting a book into another person’s hand and saying “this one’s amazing, you have to read it.” That’s something we at Blair can stand up for. Robert R. Taylor and Tuskegee: An African American Architect Designs for Booker T. Washington (NewSouth Books), by Ellen Weiss, was featured in The New York Times Friday, January 13, 2012. The book interweaves the life of the first academically trained African-American architect with his life’s work—the campus of Booker T. Washington’s Tuskegee Normal and Industrial Institute. Here’s a look at what The New York Times had to say about the book. Enjoy! Robert R. Taylor, the first professionally educated African-American architect, ran a kind of design-build program. 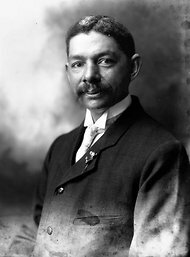 From 1892 to 1932, he drafted plans for expanding the Tuskegee Institute campus and then supervised students who fabricated and installed bricks, millwork, roofing, wiring and plumbing. The trainees learned “unobtrusivebuildings survive at Tuskegee confidence and self-reliance,” Taylor’s boss, Booker T. Washington, wrote in 1904. Dozens of Taylor’s buildings survive at Tuskegee, in Alabama, and the architectural historian Ellen Weiss has written the first monograph about him, Robert R. Taylor and Tuskegee: An African American Architect Designs for Booker T. Washington (NewSouth Books). “I feel I know him,” she said in a recent telephone interview. She pored through hundreds of pages of his correspondence, drawings and photos, mostly at Tuskegee and the Library of Congress. Robert R. Taylor in 1906. Photo courtesy of the Library of Congress. Taylor was descended from slaves and plantation owners in North Carolina. White friends who studied at the Massachusetts Institute of Technology apparently suggested that he apply there. He became the architecture school’s first black graduate. At Tuskegee, girls from the cooking classes fed construction crews for Taylor’s projects, ranging from grain silos to a chapel with a 105-foot steeple. The works appeared in magazines alongside designs by firms like McKim, Mead & White. Construction financing often came from white New Yorkers, including the railroad heiress Arabella Huntington and the politician Seth Low. Taylor favored Doric and Ionic porches on the facades, perhaps consciously adapting plantation architectural traditions into symbols of black independence. “Columns — they’re emblems of power and authority,” Ms. Weiss said. Leslie Odom Jr, Michael B. Jordan, Nate Parker, Kevin Phillips, David Oyelowo and Elijah Kelley in Red Tails. Photo courtesy of Lucasfilm Ltd.
Red Tails, the movie about the Tuskegee Airmen that was written by George Lucas and directed by Anthony Hemingway (Treme), will be out in theatres January 20, 2012. It stars Terrence Howard, Cuba Gooding Jr., and a slew of young up-and-comers including David Oyelowo (The Help) and Michael B. Jordan (Parenthood). If you want to learn more America’s first black fighter pilots, check out The Tuskegee Airmen: An Illustrated History: 1939-1949 by Joseph Caver, Jerome Ennels, and Daniel Haulman (NewSouth Books). This book uses captioned photographs to trace the airmen through the stages of training, deployment, and combat actions in North Africa, Italy, and Germany. Included for the first time are depictions of the critical support roles of doctors, nurses, mechanics, navigators, weathermen, parachute riggers, and other personnel, all of whom contributed to the airmen’s success, and many of whom went on to help complete the establishment of the 477th Composite Group. View the movie trailer here, or catch an interview with George Lucas on the Daily Show (air date: January 9, 2012). Happy new year, blog readers! If you dove into 2012 headfirst–like we did–you might already need a break! So here’s a playlist to keep you entertained while you’re back at the grind. Thanks to the folks at ParcBench and inspired by Murder on Music Row: A Music Industry Thriller, by Stuart Dill, this mix includes classic country tunes that are perfect for a murder-mystery-readin’ kind of day. And while there isn’t a Ripley Graham single in the mix, this playlist might just make you want to dance on your desk and slap your grandmaw.